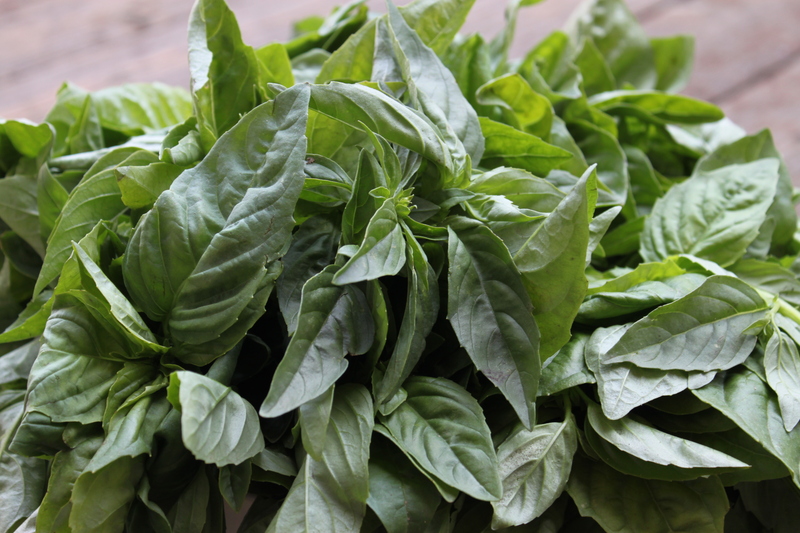 The basil in our garden just didn’t do well this year, so I ended up picking up 4 large bunches of basil at the farmers market instead. I pureed the basil in my food processor with some oil and water (the oil helps the basil defrost faster when you’re ready to use) and froze them into individual use cubes. This method also works great when adding basil into tomato basil soup. Once the cubes were frozen, I removed them from the tray and placed the frozen cubes in freezer bags – this will help prevent freezer burn and allows me to use the tray for other items. As I was taking pictures of the frozen basil cubes, I realized that they weren’t the most photogenic food items I had ever made. Who cares though?! I’m the one who’ll be enjoying the flavours of fresh basil throughout the winter (instead of buying overpriced, lackluster basil during the winter months at the grocery store). Great idea. I saw that I could buy it like that at trader joes but I sometimes get it in my CSA and hate it when it spoils.